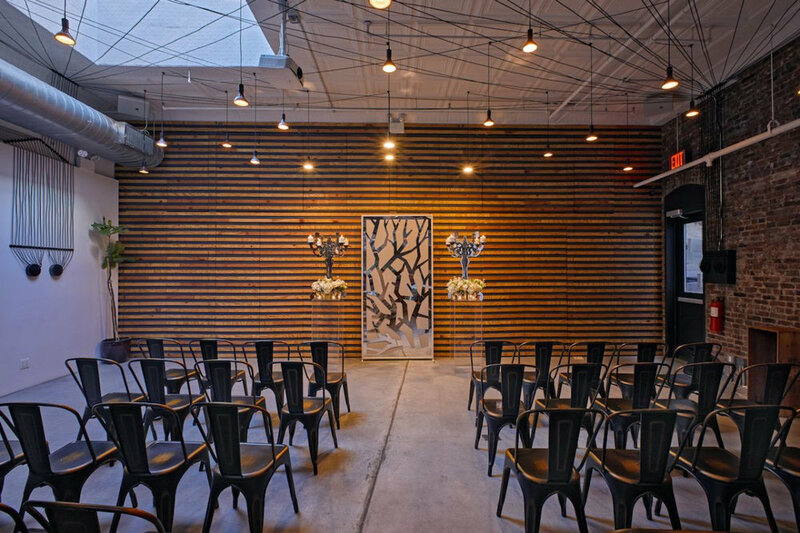 Located in the heart of NYC’s Fur District, Interface NYC is one of the city’s most versatile event spaces. Purposefully designed to maintain the charm of New York City, Interface NYC features 14ft ceilings, exposed brick lots of natural light. Boasting 2200 square feet of space, Interface NYC comes fully equipped with everything you will need to stimulate creativity or celebrate that special occasion. Staffed with a dedicated team of event planners, designers & mixologists, no event is too ambitious for us. Be it a small social gathering for friends or large networking event for corporate clients, our versatility allows us to meet all our client’s needs. Flexible enough to adapt from a theatre-styled setting to a classroom setting or even a boardroom, Interface NYC is sure to stimulate creativity and spirited discussions. Every bride dreams of that special day and our job here at Interface NYC is to make this moment a truly special one for you and your loved ones. Out team of trained professionals are on hand to look after all the details for you. Located in the heart of Chelsea, Interface was born out of the desire to revitalize NYC’s old Fur District. In collaboration with our sister restaurant Till & Sprocket, we sought to foster a sense of community. Located just few short blocks from the Madison Square Gardens, Herald Square, and the Empire State Building, Interface NYC is the one of the conveniently located venues in North Chelsea. Our open & industrial floorplan allows for ultimate flexibility while maintaining a strong sense of comfort and belonging for each of your guest. Private Parties, Experiential Events, Corporate Meetings, Cocktail Receptions, Wedding Receptions, Wedding Ceremonies, Fashion Shows, Fundraisers, Mitzvah Celebrations, Holiday Parties, Product Launches, Wine Tastings, Creative Retreats, and so much more.